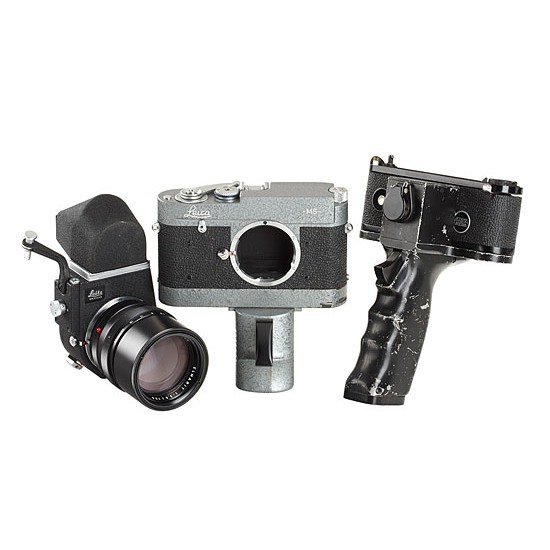 "This M camera in a gray version was produced by Leitz Canada during the Cuban missile crisis for the U.S. aerial reconnaissance. She served the American pilots flying low to photographed the Soviet missile-laden ships on their way to Cuba. To the camera, there is the special mechanical lift with a handle in a gray version, which for this camera produced Elmarit 2,8 / 135mm Nr.2064146 Visoflex III and with a special version of the (New York Hangriff engine with only 2 copies are known). This housing was not intended for use with the big viewfinder (only simple engraving of 3 times) on Zeitenrad. All the cameras are located in the famous number range 3490-3495, so one can assume that only about 6 cameras were produced, first, a Leica MS offered at an auction! Camera, lens and winder are in excellent condition"